For this we say unto you by the word of the Lord, that we which are alive and remain unto the coming of the Lord shall not prevent them which are asleep. For the Lord Himself will descend from heaven with a shout, with the voice of the archangel, and with the trump of God: and the dead in Christ shall rise first: Then we which are alive and remain shall be caught up together with them in the clouds, to meet the Lord in the air and so shall we ever be with the Lord. Wherefore comfort one another with these words. Rapture Flight to Heaven - "Fair Use for Information & Educational Purposes"
Discussions of the Pre-Trib, Rapture, & Watching for Jesus' Coming! 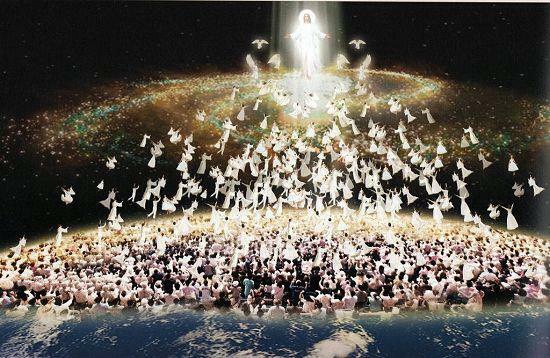 Many reasons why we believe in the Pre-Tribulation Rapture. Only the Pre Tribulation Rapture is and has always been "imminent". SALVATION - Only Through Receiving Jesus, Our Savior! Are you going to Heaven? Jesus said You must be born again to enter into God's Kingdom! Are you born again? And much more about Jesus, etc. Use your God-given discernment; not all dreams are from God. Messages to those Left Behind - What Now? Videos - Worship God for the Lord is Worthy!